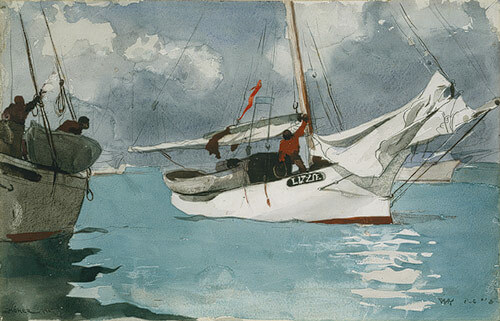 Our challenge painting this month by Winslow Homer gave us much to explore, dream and discover. The sailing motif is evident as is the fresh hues of a hot summer day at the beach. The entries this month were so powerful in their imagery and color palette. Thank you again for taking up the challenge! You inspire us more than you know! 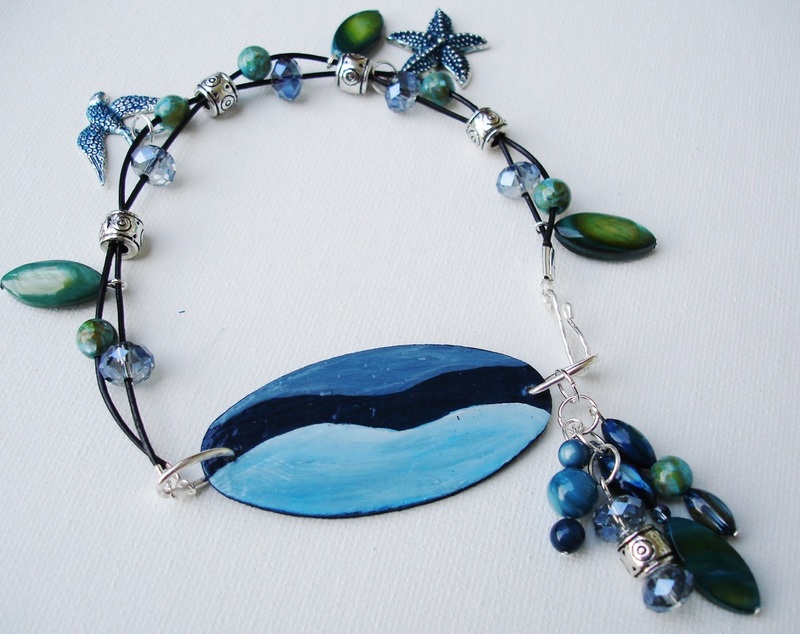 An abstract representation of both the sea and the sky is what the Creative Atelier (above) was after with this handmade focal on her bracelet honoring the easy breezy feel of being at the seashore. Emma from A Polymer Penchant shares with us the story behind making her abstract polymer clay beads inspired by seeing this painting from a birds’ eye view. I am fascinated with learning how our participants interpret the challenge artwork and this is just a brilliant vision put into action! Taking her inspiration from the deep browns and abundant blues in the challenge painting, Miss Terri of Terri’s Blooming Ideas gives us an end of summer color palette that will be worn well into fall. I love the way the chocolate brown and the light blue work so well together in this classic color combination with a fresh twist. 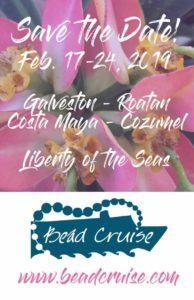 Kim Idalski of Kimi’s Jewelry and Gifts takes us on a journey through her inspiration and melds that with a recent trip to the water. She could just close her eyes and recall the feeling of the waves, the blue of the sky, the smell of the fresh air. Her polymer clay pendant evokes the spirit of this painting so very well. Miss Monique of A Half Baked Notion really played off the sailboat inspiration. I am constantly amazed at what you can do with polymer clay. 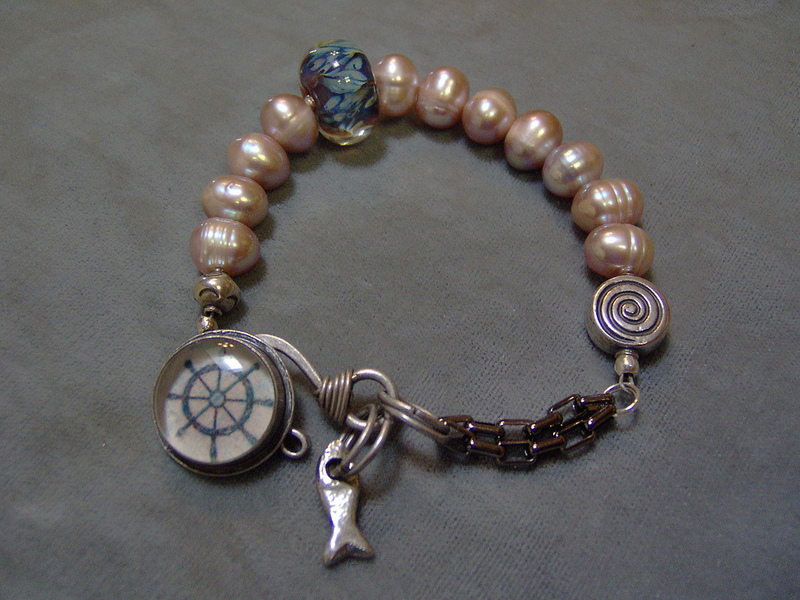 Her Catch of the Day bracelet features the rope like the rigging, a hand made button that looks just like the ship’s wheel and the focal is a beautiful faux sea glass effect. But those little fishies are what I love the most! So clever and her project doesn’t use anything metal in it! I love that there are so many different directions that a painting can take us in. Miss Lynne of Island Girls Insights has actually been to Key West and chose to use their lighthouse as her focal. 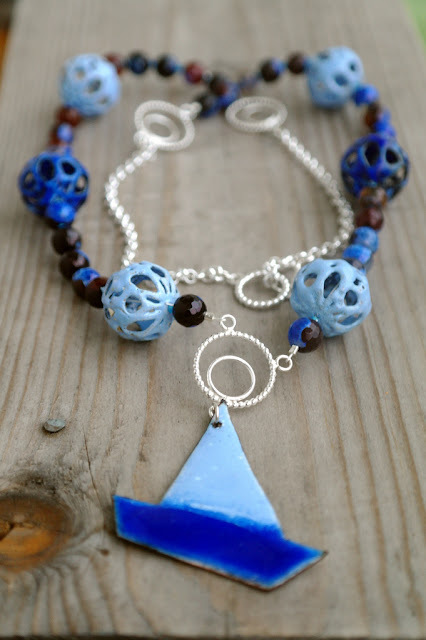 She created a clever lighthouse that she enameled and made the entire necklace by hand. Check it out! You can feel the wind in my sails with this beautiful necklace from Kirsi in Finland (above). I swear I can almost hear the waves crashing! And Kirsi gave us three different looks for the challenge this month. She was inspired! Our friend Ine of Jewels by Ine from Belgium gives us a playful look at the seashore with her bright and pretty bracelet. It makes me think of beach balls and sand castles and setting sail on a small sailboat for distant shore. Fun and flirty and fresh! Cece Cormier of the Beading Yogini captured the stormy seas with her beautiful bangle. The soft fiber around the hard wire and the little pop of red make this something special. 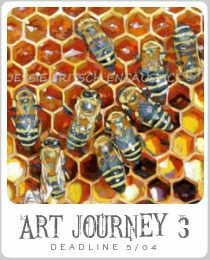 Pam from Klassy Joolz (above) gives us two entries this month, both with resin pieces with which she is experimenting. They both have a nautical flair, one more elegant and one more simple. I like them both and I encourage you to keep exploring the possibilities with this medium! I love the earrings and necklace that Janet Bocciardi of Honey from the Bee created. 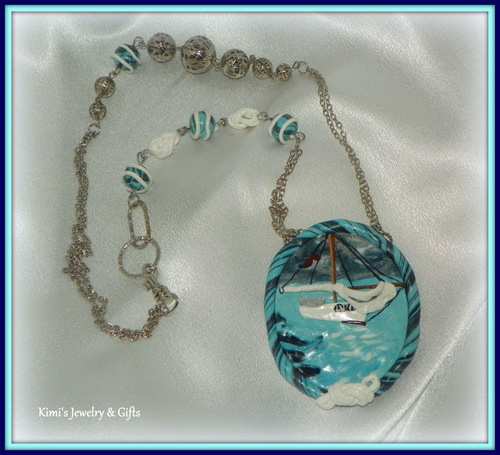 The lampwork is the perfect color of a stormy sea, the blue silk and bubbles of blue like the ocean waves, the pops of red balance all the blue out and the gorgeous vintage carved shell medallions are perfect with the white silk for the sails. Beautiful! Key West is a favorite place for Miss Mary Ellen of Bee Tree by m.e. I can just hear the waves crashing and feel the sand squish between my toes with her pretty necklace. I loved reading about her first hand knowledge of coral from her time spend scuba diving. This will be the perfect thing to wear in winter when you need that little reminder that summer will indeed come again! Thank you for joining us on our journey of inspiration this month. 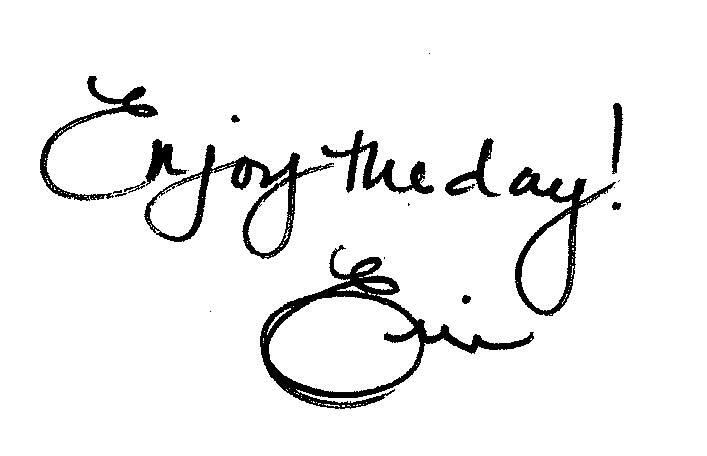 Go out and enjoy the last of the summer days! Check back next week to find out what challenge we have selected for September. It is a good one! Winner of Melinda Orr Bonus Giveaway! Disappointed the my submissions didn't make the blog tour. Thank you so much! I am thrilled I was featured in the Monthly Blog Tour. Thank you for the lovely challenges every month! This was the first time I joined, loved it! thanks! Enjoyed reading about everyone's challenge pieces and as usual, ABS has found another great fine art piece to inspire us all! thank you for your sweet words about my pieces. It's going to be difficult to part with them. What wonderful entries this time! 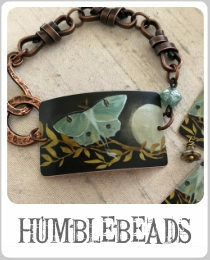 Thank you so much for featuring my bracelet in the Monthly Blog Tour and for encouraging me to keep working with resin. I love the monthly challenges and all the creative talent out there! First time playing with the monthly challenge and thanks for saying such kind things about my piece. All the entries were so varied…I loved it!